The first Barbie ever to enter our house did so a few weeks ago. 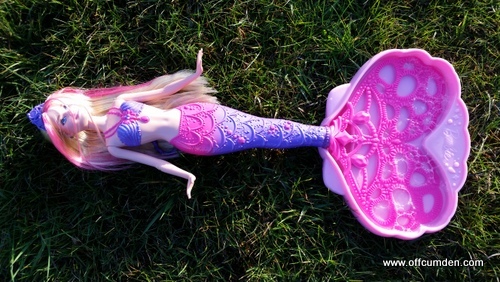 We have had a lot of fun reviewing the Barbie Bubble-Tastic Mermaid. So much so, that I sure am pretty sure she won't be the last Barbie we own! My children have recently started watching channel five in the morning. I'm not very keen, largely because I despise Peppa Pig, but also because there are adverts. This means they request literally everything they see. The adverts are the main thing I dislike! 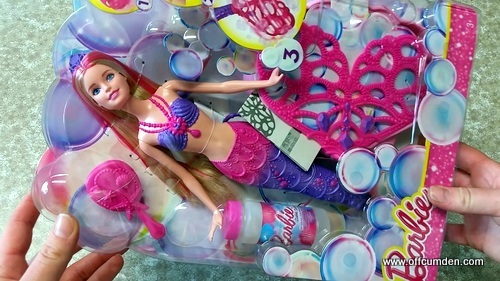 My daughter recently saw the Barbie Bubble-Tastic Mermaid in an advert and instantly asked if she could have it. This surprised me. She's not really into pink. She doesn't really wear pink, play with dolls, or do anything stereotypically 'girly'!She is generally to be found wearing a Spiderman outfit with dirty feet or knees from playing outside. The Barbie comes in a box with the doll, the tail, bubbles, a tray for the bubble fluid and a brush. It looked appealing and fun from the packaging and I have to admit that I was looking forward to opening the box too! Once opened, there is a lot of pink! I am a fan of Barbie's pink streaks in her hair. Very Sprinkle of Glitter! We didn't waste and time and got outside to try out her bubble-making capabilities. It is very easy for a child to use. My daughter had no problem pulling the string which creates the bubbles. 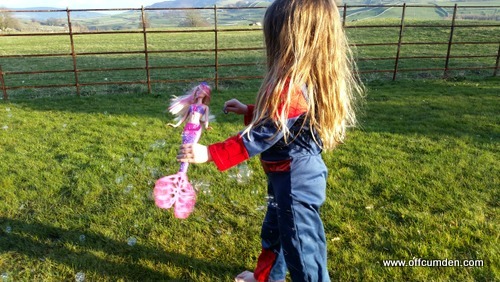 For the first time ever girls cans make their own fantastic fun with this magnificent Barbie™ Bubble-tastic Mermaid. This bubble making Barbie® comes with a pretty shell-shaped dipping tray to hold the bubble solution – simply pour the solution into the pink tray then dip Barbie® Mermaid’s giant pretty pink fin into the solution and remove. The pretty pink cut-outs on her fin do more than look pretty! Go ahead and pull the string on Barbie’s back to cause the fin to spin round and create oceans of bubbles for girls to chase, pop or simply make more of! In my daughter's true style, she played with the Barbie whilst dressed in her favourite Spiderman outfit! She's pretty ace! I would recommend the Barbie Bubble-Tastic Mermaid doll. It's a fun toy and the amount of bubbles it produces is impressive! My daughter has had a great time playing with it and she wants to take it with her on holiday this weekend! Disclosure: We were sent this item for the purpose of review. This had no impact on the post, thich was honest and fair.